People in the media continue to assert their "right to know," that is, someone else's obligation to inform them, every time a story that they deem newsworthy comes out. As entertaining as the jokes about Vice President Cheney's hunting accident may have been, the story simply wasn't worth harping on for days. Cheney's mishap has no broader implications. However, other accidents do have broader implications. We don't always hear about them, and they rarely make front page news. How many of you knew, for example, that only weeks ago a Fairfax County, VA police officer "accidentally shot and killed an optometrist outside the unarmed man's townhouse ... as an undercover detective was about to arrest him on suspicion of gambling on sports." Of course the media did not assert it's "right to know" when the officer's name was not divulged. According to the Washington Post, "The officer, a 17-year veteran assigned to the police tactical unit, was not identified. He was placed on leave with pay while police conduct both an internal administrative investigation and a criminal investigation." Yet this officer's mistake cost 37-year old Salvatore Culosi his life. Perhaps the media is more forgiving of police officers, whose job is to know how to handle weapons responsibly to protect people. While I can choose the people with whom I go hunting, I have no say in whether a police officer in my county is careful when arresting unarmed individuals. While most Americans will probably never encounter Vice President Cheney, let alone go hunting with him, many of them will encounter police officers. If news sources wanted an accident to be truly outraged about, this is it. If news sources really wanted to assert their "right to know," here's where they could do it. Instead, they are happy to drop the story without publishing the outcome of the investigation and without knowing even the officer's name. If that's the case, why is she holding a sign to protest? In the United States, we have devoted the first amendment to the Constitution to protect freedom of speech, freedom of the press, and freedom of religion. We’ve limited the role of government in deciding and enforcing all moral questions. Instead, we have designated government’s role as an alliance of people and states dedicated to protecting life, liberty and property. However, universally it seems that people continue to run to government screaming of various perceived injustices. We allow government to take on the role of the elementary school teacher, to whom we run when the other kids make fun of us or don’t share their toys or refuse to let us join them in a game of football at recess. It is not enough that we have the right to our own lives, property and freedom. We want property belonging to others. We redefine terms like “public use.” We want our speech to be unrestricted, but insist that others do not have the right to insult us. We make up terms like “hate speech” so we can ask government to regulate what others say. 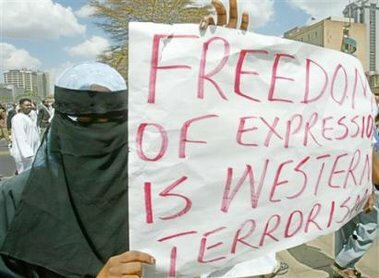 After Danish cartoonists published cartoons that negatively depicted Mohammed, a prophet according to Islam, there were more cries against freedom of speech. Arguments ranged from declaring that the press is an institution to serve the public interest to declaring that the cartoons fall under the category of “hate speech” and cannot be protected. They’ve all tried claiming that the issue is not freedom of speech, per se, but an issue of fairness or some other newly invented right. "There is a fine line between criticism and abuse. One has the right to criticise aspects of Islam, but one should not have the right to make fun of Muslims or their faith." (Both taken from Bangladesh news sources). “Jyllands-Posten refused to publish caricatures of Jesus in 2003 because they would “offend” its readers. Why then is its invitation to caricature Muhammad protected by free speech provisions?” asked authors Na'eem Jeenah, Charles Amjad-Ali and Salim Vally in their article entitled, "This is Not About Freedom of Speech." Why? As the owner of the paper and printing equipment, the newspaper can decide what it wishes to publish and what it does not. Had the newspaper chosen to publish caricatures of Jesus in 2003, those would have been protected under free speech. The decision not to offend in one instance can be motivated out of one’s moral convictions or one’s desire to keep profits high. But the main reason why is to avoid occurrences such as this one, which are common in countries that allow the government to influence what is published or said. "Two weekly newspaper editors charged with "harming religious feelings" by reprinting offensive caricatures of the Prophet Mohammed were released on bail Sunday after a request was made by Jordan's press watchdog." according to an Israeli newspaper. The "cost" is that some taxpayers get to keep a little bit more of their money over the next decade. It does not mean that Americans have lost $1.4 trillion by 2016. Instead, that money will have been spent on goods and services that people value. It will be invested in companies, used to generate wealth and develop new technologies. Just because the money is not in the hands of bureaucrats does not mean it has disappeared. The real cost to taxpayers is the $2.77 trillion dollars that the government spends. Regardless of whether we see any of the benefits from government programs, we are forced to bear the cost of politicians' spending whims. There's no way to 'opt out' of these programs, even if we can fully demonstrate that we are not the recipients of the benefits the programs offer. I can't say "Mr. President, I am not going to pay for your 'No Child Left Behind' initiative. I obtain no benefit from the program. I have no children, and if someday I do, I will use my own money to educate them." According to the article, "Democrats attacked what they said were Bush's skewed priorities. They said he was trying to impose austere budgets that will harm programs for the poor while protecting tax cuts Democrats said were going primarily to the wealthy." Certainly there are some people who are better off as a result of government programs which take money from others and distribute it (in various forms) to those who did not earn it themselves. Does this mean that Democrats have a valid claim that cutting programs that helped the poor is a costs poor people? It is no more valid than if I claim that if my parents last year gave me a $100 gift certificate and this year gave me a $75 gift certificate, it has cost me $25. Before we start labeling costs, we'd better ask ourselves one simple question: cost to whom? What Remedy Will the Court Prescribe? A Washington Post headline today read, "Women Sue Wal-Mart Over Morning-After Pill." At first, one might think that women who had taken the drug had experienced complications, that the drug was ineffective, or that it conflicted with another drug they were taking at the same time. But Wal-Mart doesn't even carry the 'morning-after' pill. That's exactly why the women are suing. According to the Post, "Backed by abortion rights groups, three Massachusetts women sued Wal-Mart on Wednesday, accusing the retail giant of violating a state regulation by failing to stock emergency contraception pills in its pharmacies. The lawsuit, filed in state court, seeks to force the company to carry the morning-after pill in its 44 Wal-Marts and four Sam Club stores in Massachusetts." The article notes that state policy requires pharmacies to stock all "commonly prescribed medicines," and that one of Wal-Mart's competitors, CVS Pharmacy, stocks the morning-after pill in all of its stores. To be honest, I'd never thought of it before, but now I'm considering a few similar lawsuits. I went to Nordstrom before forecasts of sleet and snow came out. Knowing that my worn tires would be slippery in snow or ice, I set out to buy some emergency tires. Believe it or not, Nordstrom actually refuses to carry tires. At other department stores located at ends of malls - Sears, for example - tires are commonly held items. Perhaps the courts can also consider forcing Nordstrom to start carrying tires. Even more recently, I stopped by a hair salon. As I perused the products in the displays, I noticed that the salon did not carry my brand of shampoo and conditioner. How unfortunate! Normally, I'd think to go to another store to find it, not to the nearest courthouse. The promise of profit, of enjoying one's choice of career, of providing specialized and valuable services all inspire people to take on the risk of starting a business. These entrepreneurs enable people like you and me to have what we want when we want it. They're not miracle workers or public servants. They have every right to choose which services to provide, which products to sell, when to open, when to close, and the placement and number of locations to have. I sell my services to my employer. If for some reason, I refuse to provide a service that my company demands, the company has every right to stop purchasing my services (i.e. they can fire me). However, we would not expect to grant my company the right to obtain a court order to force me to provide a service that I refuse to provide. Like the Wal-Mart shopper who can't find the products she's looking for, my company would simply take its pocketbook elsewhere.